Some black seats, some white ones and the stadium’s sponsor name created with part of them. This is what’s already created of a large 42,000-seat mosaic at Vodafone Arena. 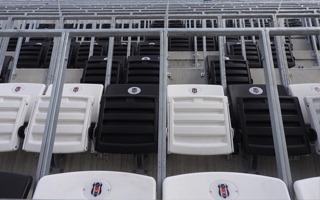 Last week the seat installation process began at Vodafone Arena, new stadium for Beşiktaş. The Istanbul club will see a black-white mosaic created, accordingly with their colours. First seats were installed on the upper east side. Throughout the upper ring seating will be installed along with railings due to the high slope. Still, when empty, the name Vodafone Arena created with white seats should be clearly visible. On the level below, TV cameras will see a large Beşiktaş JK sign. Below we present the final layout that should be seen within the next couple of months. The stadium has already experienced several delays compared to initial schedule, so there seems to be a curious optimism among fans associated to the arrival of seats. Should everything go along expectations, the building might be ready before season end, possibly in March/April. While at this moment we weren’t able to confirm a definite date for delivery, meeting such deadline again seems unlikely.